The Trees Campervan Trips: Week 2. 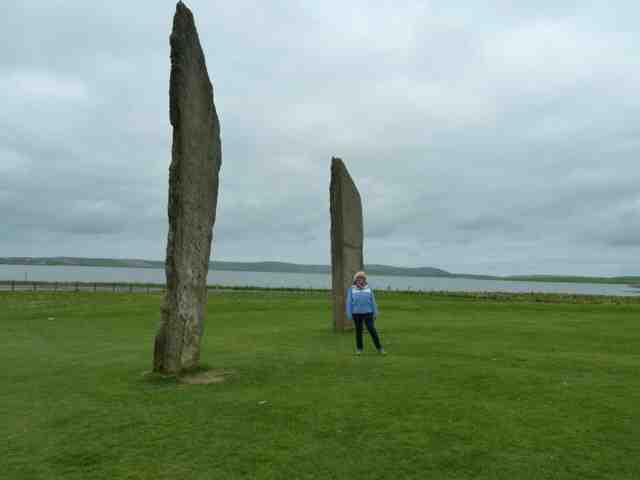 Orkney and back. 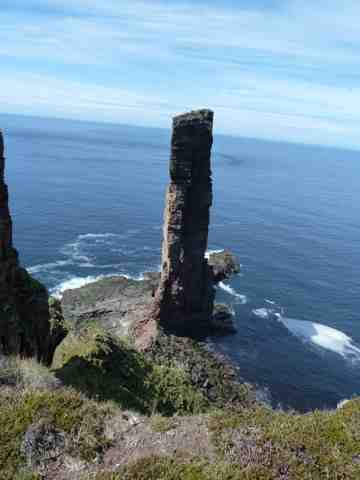 Today we set off from Thurso on the way to Gills Bay to catch the ferry across the Pentland Firth to the Orkney Isles. 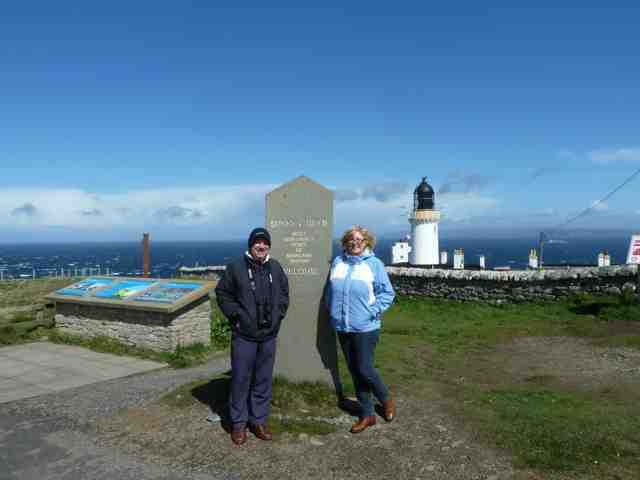 We detoured off the main route to go to Dunnet Head viewpoint -the most northerly part of the UK! As we were driving along the road through peat moor like environment to Dunnet Head we were passed on the road by a Staffordshire Bull Terrier running hell for leather down the road-in the middle of nowhere! "that's bizarre" Graham vocalised. The viewpoint has a lighthouse where we saw (presumably) the lighthouse keeper who was looking for a runaway dog. We reported our sighting, the man stated "he's just shat on the bathroom floor and thinks he's in trouble" (we assumed he meant the dog). He then proceeded to run also hell for leather whistling in call for said dog! We put it down to the remoteness and constant wind. The wind was howling and the sea looked rather angry -not reassuring for our imminent ferry journey! residence in Caithness. Apparently Prince Charles stays there every August, probably drinking Chateau Nenin from their extensive cellar. The castle was lovely -small in scale with beautiful gardens overlooking the sea. We had a coffee and cream scone in the tasteful tea rooms -very "Farrow and Ball" in decor. 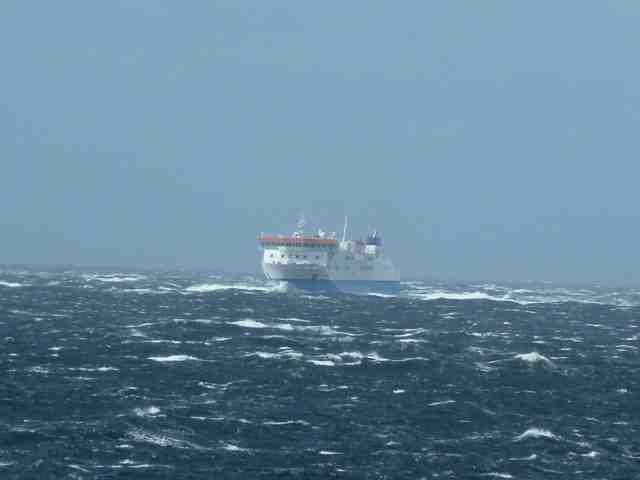 Next we took the ferry - the wind was a strong North Westerly and it alternated between sun and hail but always the wind F7 at least. 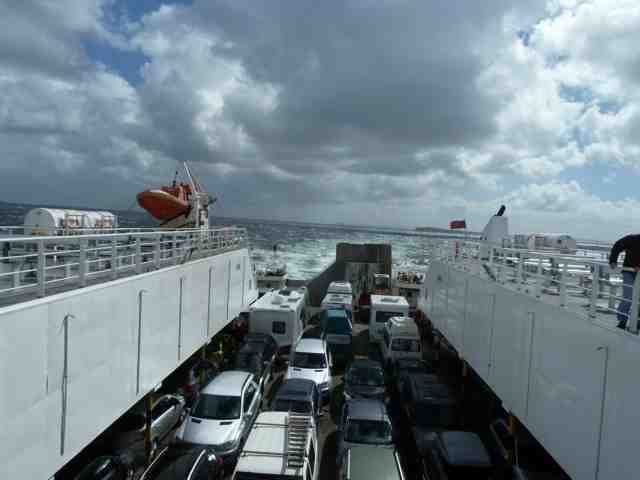 We wondered with fellow motorhomers at exactly what wind force the ferry stops running. Good job we had the scones earlier as I've heard raspberry jam is very good for sea sickness - it doesn't actually stop the sickness but it does make it taste a bit better if it happens. This our little ferry with Rex in the middle, second from back, behind the green van. This is a larger ferry we passed, showing the sea state. We think this was going back to Aberdeen or Inverness. We were in a MUCH smaller ferry. 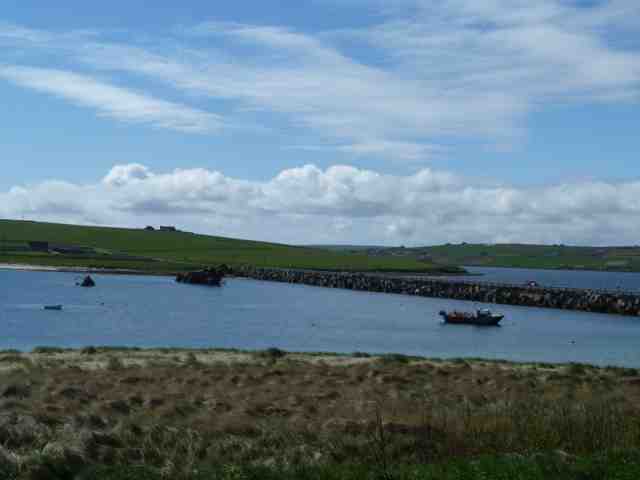 We arrived at St Margarets Hope on South Ronaldsay and drove over the Churchill Barriers on to mainland Orkney. These barriers were built with the aid of many prisoners of war in the 2nd World War to prevent submarine entry. Italian prisoners of war decorated one of their mizzen huts in the style of an Italian Chapel -we decided to visit this on our return journey to the ferry terminal as the weather was truely horrible! Our last port of call today was the campsite in Kirkwall -at the side of the local leisure centre called The Pickaquay Centre. As the weather was so nasty -wind, rain and bitterly cold we decided to batten down the hatches and eat in the van and later watch The Apprentice on TV.Thankfully we got a signal! and Carol endured watching Pointless on TV whilst Graham walked to Tescos to get our Tesco special £10 meal -we know how to live! Woke up to the same howling gale force winds and rain. We heard on the radio that many ferries had been cancelled and it still felt bitterly cold! The first thing we did was go shopping for Carol a woolly hat and a pair of gloves for us both in downtown Kirkwall. 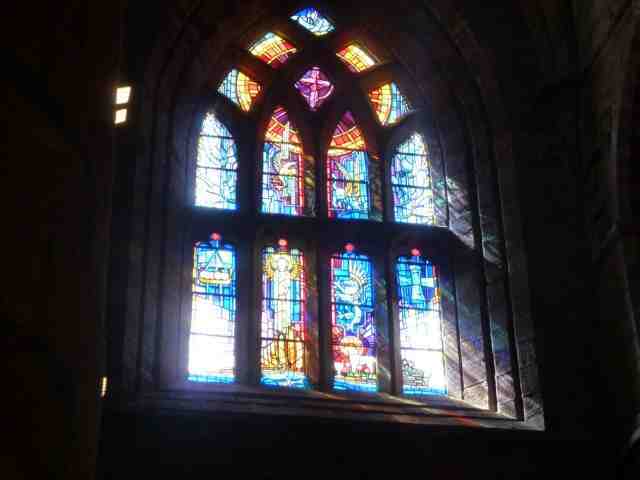 Once purchased we were practically swept by the wind down the main street and into St Magnus Cathedral. An impressive small cathedral built in red and yellow stone begun in 1137 and added to and extended over the centuries.There are some beautiful stained glass windows mostly from early 20th century but one installed in 1987 to commemorate it's 850th anniversary. We also walked past the Bishop's palace and Earl's palace on our way to the St Magnus Centre. This centre has been built by the Friends of St Magnus cathedral and contained meeting rooms,a Norwegian library and shop and coffee bar. We watched a short 15 mins film about the Cathedral which was very informative. It's a long and complicated story about Viking cousins, one good and one bad. The bad one betrays and kills the other (Magnus) whose martyred grave then miraculously cures sick visitors. 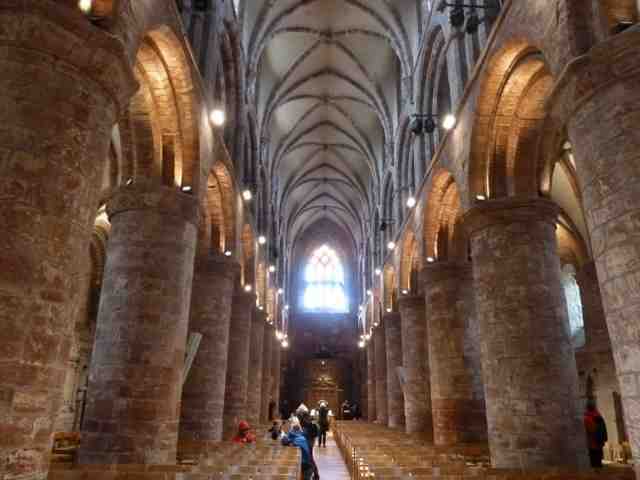 fast forward a couple of generations and Magnus (the dead one) becomes St. Magnus and has a cathedral built after him. museum but that was also closed due to staff shortages. Kirkwall = St Magnus basically. Tonight went to the cinema at the Pickaquay Centre to see a french film called Amour - very cultured! Carol thought it was beautifully filmed and acted - very thought provoking-about an elderly couple living in a parisien apartment confronting illness at the end of their lives. Graham said it was only just better than working! Tomorrow we will make our way to Stromness. 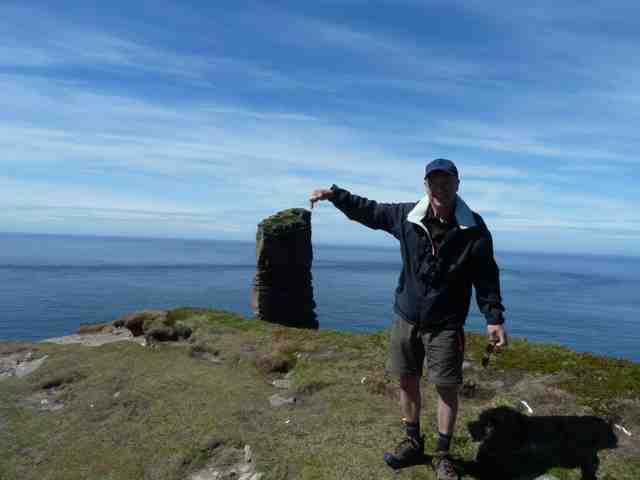 Stromness is about 16 miles away, so plenty of time. Rating for the Pickaquay Centre 9/10. Excellent facilities and friendly wardens. Downside was it was very much a municipal site near to a main road. Apologies - these are long ones. There is a lot do to in Stromness! We then decided to catch the ferry from Houton to Lyness on the Isle of Hoy. We went to visit the Scapa Flow Visitor Centre. Visions of a modern glass/wood visitor centre with fresh coffee and cakes were dashed when we saw the an old pump house from the 2nd World War with the information film sited in an old oil tank! (yes, but a 15,000 ton oil tank - Ed.) The exhibits and descriptions had a distinct feel of the immediate post war era - the tea room felt and looked like a war time Naafi! We spent a couple of hours there - Graham said he could have spent longer (yawn from Carol). It certainly gave an insight in to the 1st World War - describing the scuppering of the German Fleet, and the use of the area as the base for the British Fleet in the 2nd World War and it's significance as a communication centre with thousands of personnel based there. There is also a monument to the 833 sailors lost when the ship Royal Oak was sunk by a german sub in the 2nd World War - which influenced Churchill's decision to order the building of the anti submarine barriers between the small islands in Scapa Flow. During the wars there were thousands of service men and women working there - today there is little building remaining and an air of abandoned decay. Graham: I actually really enjoyed the visitor centre and I'm staggered at the naval operation. There were a massive number of warships stationed in scapa flow, which ferries now criss-cross with tourists and workmen. Imagine just the task of fuelling these giants of 20-30,000 ton warships which burn fuel at God-knows-how-many gallons per minute! One interesting fact is that 74 german battleships were scuttled (by the germans) after the 1st world war and were salvaged between the wars. The steel salvaged was used in the space explorer Voyager because coming from a pre-atomic age it is radiation free and doesn't interfere with delicate navigation instruments. 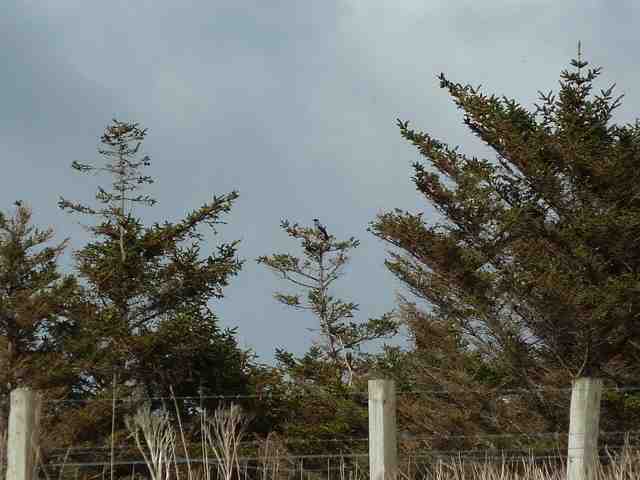 On our return to mainland Orkney as we drove along the road from the ferry a large owl (possibly a short eared owl? - brown and bigger than a barn owl, but hunting in daylight) flew and hovered for quite a while along the roadside within feet of Rex - of course as soon as Graham tried to take a photo, it flew off. Another highlight! And so we reached Stromness. Stomness gets 10/10. Stromness in sun and with a folk festival gets 15/10. The sat-nav took us bang into the centre, into narrower and narrower cobbled streets. Cue 16-point turn in front of Stromness Hotel and crowds of merry Folkies. 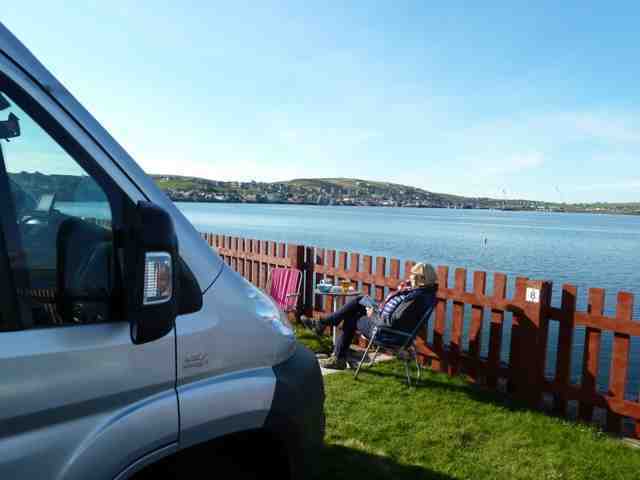 Eventually we find our campsite, on a hook of land overlooking Stromness straights and harbour - what a view! On arrival we took the last empty pitch with a reserved sign (thinking it was reserved for us). Oh dear! Roland and Jenny turned up in their neat VW campervan wondering why we were in their slot. We negotiated to share as it was a good location and plenty big enough. Roland and Jenny were hardened Folkies and had tickets to practically everything and soon left to go to their next gig. We settled in and then headed in to Stromness for some pub grub -we had tickets for a gig at 10.30 pm. Every pub had a fiddle band in a corner, rotating between pubs for the free beer. We had a meal in one and a drink in another and then headed off to our gig. The music was mixed - some great, some ok -the young crowd were loving it. We left at midnight as we had an early start the next day. Up early for an action day today. 40 minute passenger ferry across to Hoy left at 9:30 (early for us); cycle ride across the island, a walk to the Old Man of Hoy, cycle back to catch ferry docking at 7:15 and straight to a gig which starts at 7:30. 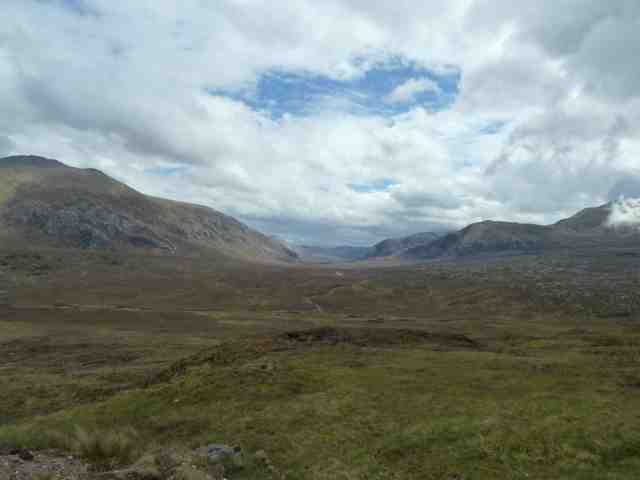 Hoy is hilly and very sparsely populated with RSPB being the biggest landowner. 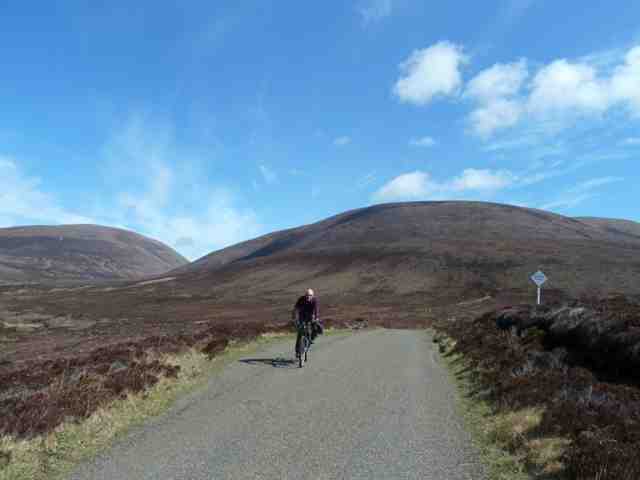 The renowned beauty spot we were cycling to was Rackwick Bay. A place you are welcome to wild camp. 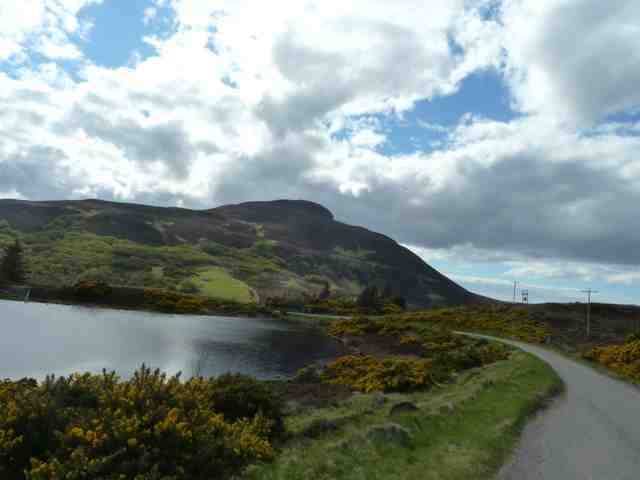 From there is is a 5.5 mile round walk to the Old Man. The Old Man is a 450ft stack of sandstone on a granite base made famous by Chris Bonnington who made a televised climb in 1966. It's a good walk to see large Great Skuas known as bronxies who prey on smaller birds carrying back fish and their eggs. The Skuas didn't like our sandwich crusts though. We visited the "Dwarfie Stane" on the way back - what looks to be a simple shelter made of enormous rock slabs with a entrance hole -a slab lying outside it which appeared just the right size to fit the entrance hole as if it was rolled in to place as a doorway (must have been strong little dwarfies, ha ha). No one is sure what it was used for -local folklore has it that dwarfs or other little people lived there -but it probably was a Hermitage. However the scenery certainly has the feel of Rivendale! There is a small cafe just a few minutes from the ferry so we had our dinner there with a welcome Magners as a reward for our endeavours.Actually we also had our breakfast -bacon butty- and lunch there- a cafe prepared packed lunch! -the owners were very friendly! On our return to Stromness we then peddled hell for leather back to the campsite as Carol had left the tickets for the evenings gig!-and marched back to Stromness Town Hall where the gig was taking place arriving just 5 mins late at 7.35pm. We particularly liked a band called" The Dirty Beggars" who were followed by what appeared to be a local comedy band almost vaudeville in style (must be an orcadian thing) called the "No String Band" -but crept out at 10pm during "The Henry Girls" - sweet Irish girls singing with fiddles-not dirty enough for us!! A few drinks -then off back to bed as catching the ferry back to mainland Scotland tomorrow. Rating for Point of Ness site -7/10. Brilliant location. Poor shower/washing facilities -no doubt not helped by being full to capacity.We preferred to shower in Rex! Tried to get up and at them for 9am departure-managed 10am! Carol wanted to view the Italian Chapel on the way to the ferry back at St Margarets Hope. 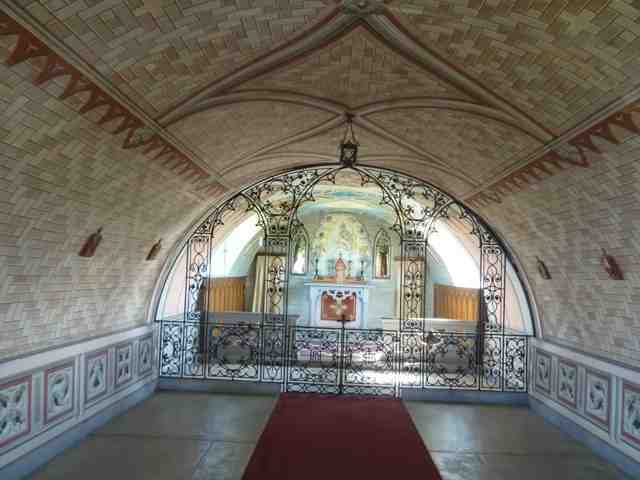 The Italian Chapel was amazing - a mizzen hut decorated by Italian Prisoners of War of Camp 60 on the isle of Lambholm. These men were captured in the later years of the 2nd World War during the North African campaign and sent to work in Orkney on the Churchill Barriers. An artistic prisoner Domenico Chiocchetti with a small band of helpers set to in late 1943 to build the chapel using scrap materials and decorate it with frescos. 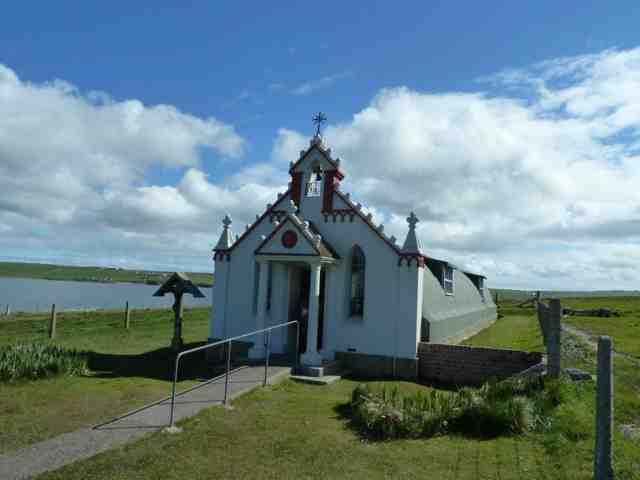 When the prisoners left the Orkadians promised to cherish the chapel and it became a place of pilgrimage for anyone holidaying on Orkney. In the 1950's a renovation fund was set up and Chiocchetti was traced in Italy and in 1960 he returned to restore the paint work. It remains a very popular attraction today - demonstrated by the swarm of coach trippers witnessed on our viewing. Once again we crossed the Churchill Barriers on the way to the ferry. Bit disappointed with the photos as the camera battery was giving up but hope this gives a flavour. The site we stayed at was on the cliff top overlooking the beach - view out of Rex's back window, bike rack in foreground. We had a van prepared dinner and a relatively early night as we were both rather shattered from our Stromness experience! It rained continuously throughout the night and was very breezy in the morning with a spattering of rain. A lazy start and then a walk to Balnakiel where there is a Craft Village housed in a rather grim 1940s old military base. The crafts-painting,ceramics etc were not to our taste but the artisan chocolate shop was! The weather remained uninspiring so we decided to cut our losses and set off to get a little nearer to Ullapool rather than stay another night as the ferry required an early start. The facilities on the site were also rather poor. Rating for Sango Sands Oasis site 7/10 -for the location only-we were disappointed with the facilities and again Carol preferred to shower in Rex! 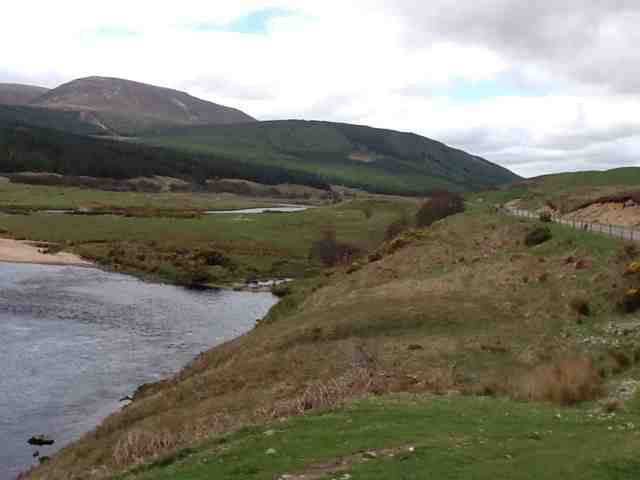 Again despite the rain we had a fantastic drive through stunning scenery. We decided to stop over in Scourie at the Caravan and Camping site there -a great location and very good facilities! As it has rained most of the day we took advantage to do our laundry in the fab laundry room and then chilled in Rex. The site has a restaurant and a bar! Will take advantage of this as we are off to the Western Isles tomorrow and think the campsites chosen will have limited facilities. 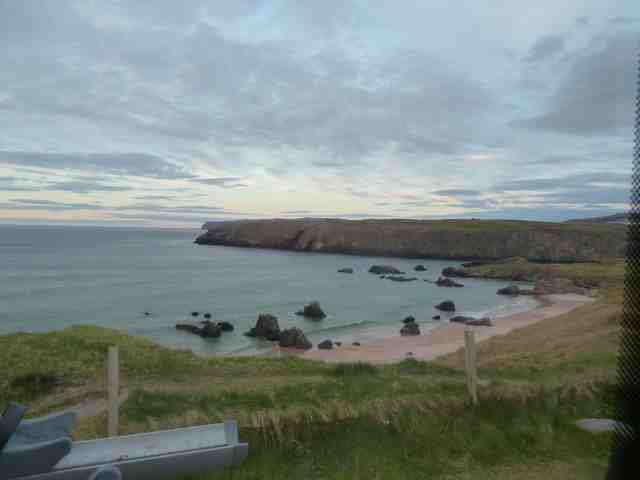 Drive down from Durness to Scourie. 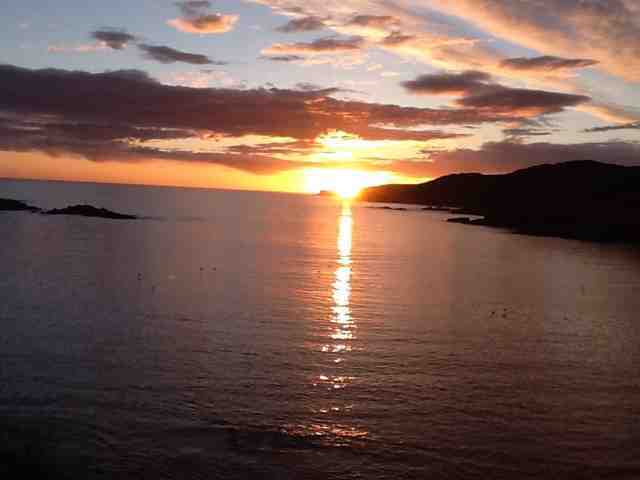 Rating for Scourie -a perfect 10! Great location and facilities and on site bar! Update: The bar stops serving food at 8pm! What!! We took the drinks back to Rex and Carol knocked up another michelin starred dish. Rating downgrade - 9\10! Not only did Carol have to cook dinner after the promise of a night off- the showers were not as good as they promised! Lovely little site though. Birder's corner: Apart from the usual terns, gulls, oystercatchers, shags, guillimots we also added Eider ducks to our list. These male sea ducks are a lovely combination of black and white whilst the females are a bland brown colour. A little bigger than a mallard it must take a lot of these to fill an eiderdown!